Click here to find out ../what's new on this site. Anthony de Longis' session started with a short video presentation on some of the work he's done over the years, including his work as a trainer on Bad Girls and Batman Returns. As it finished, he commented wryly, "this overnight success stuff takes longer than I thought". 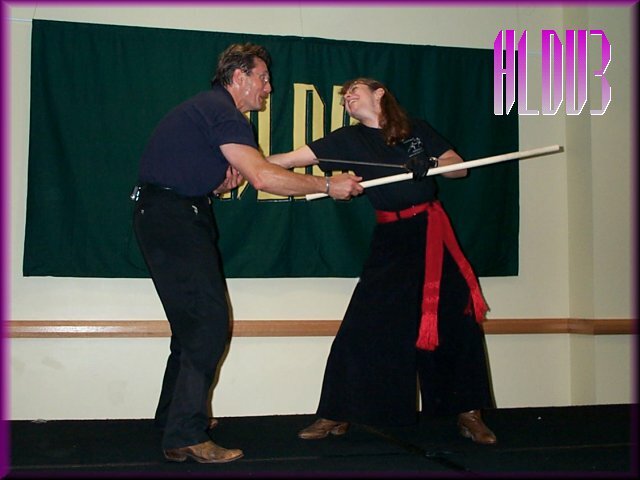 Most of his session was taken up in a demonstration of how a fight is put together for stage or screen, with Mary Gallien helping him, but in between action, Anthony spoke about some of the things that were behind what we were seeing. He said that he had had writers at the Sword Spectacular weekend working in pairs to script the demonstrations that were done there, but that contributions came from all parts and the end product was, as he put it, a "melange". He said that a fight should involve the audience and that the action is, in his view, dialogue. 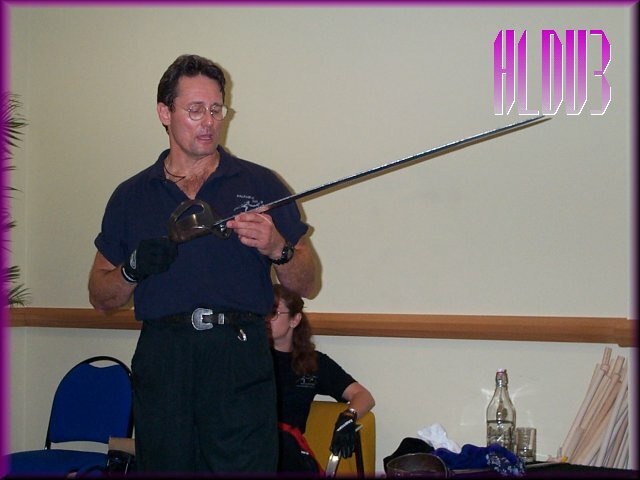 Anthony will be the action co-ordinator and sword master for the forthcoming syndicated TV series Queen Of Swords, to be filmed in Spain over the coming months. He said it combined two of his favourites - horses and swords. He said that the bad guys will be "misguided military" and so he expects a lot of sabres to appear on the show. Mary told us that the website will be at www.thequeenofswords.com when it is up and running. He spoke of how things change in swords and quoted F Braun McAsh, who said that things changed only when they stopped working. At this point, he started his walkthrough with Mary and started to develop the fight. The audience had to come up with a scenario, so we cast Mary as the slighted but feisty heroine going to seek a confrontation with Anthony, the dastardly villain of the piece. Complaints were heard from the stage about typecasting, but he accepted the role. As they started to choreograph the fight, he was asked how film had changed sword fighting. He said that film swords should be fun and quoted the kind of fights seen in Errol Flynn's era. He said he wanted to bring that back to Queen of Swords. He said that the way it was done for Flynn required multiple takes with a single camera, which is expensive, but now they can use a Steadicam, which has only become available in the 90s. He said that sometimes fights pull in close on the actors, to hide a lack of skill or rehearsal. He said that this makes it difficult for the audience to follow the action sometimes, and that a fight should make them embrace it as if they were active participants. He was asked about undercranking, (that is, running the film through at slightly slower speed, so that when it is shown at normal speed of 24 frames per second, the action is speeded up). He said that some of the fights in Star Wars had been filmed at 10fps, with the actors walking the fight through, but traditionally, 22 or 23fps was the speed at which fights were filmed, if they were undercranked at all, otherwise it became too obvious. He said that Jackie Chan is a typical example of someone who undercranks. Asked about the use of the knife and sword, he commented that if you can get inside the opponent's guard with a knife, the sword will always be in trouble. He said that in developing a fight, you had to have a common rhythm for timing, but it was important to bring in the character's rhythm as well. He said that he has used some shields, but he doesn't find them very interesting. He noted that they can be lethal in their own right and quoted F Braun McAsh's use of a shield in "Homeland", where Kanwulf had it across his back, as interesting. He said that the fight in "Rob Roy" had been realistic, where Liam Neeson's Rob Roy was slowly worn down by the fop with the rapier, as he said that the heavier sword would be less manoeuvrable. 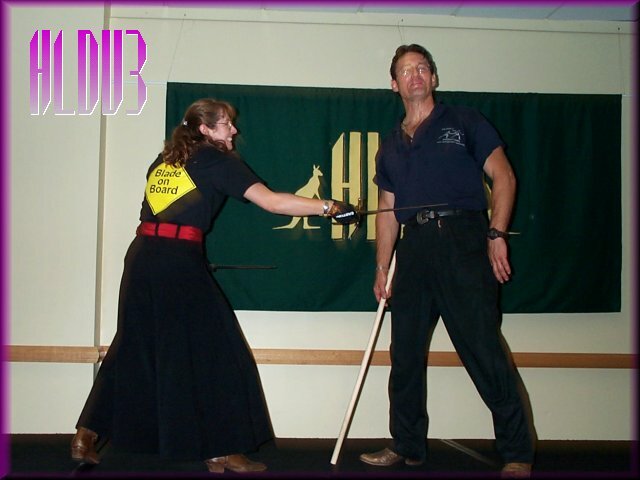 He said that he had been given a heavy sword to use in "Blackmail", which was a good match for the katana, but he had just recovered from tennis elbow and had to use two hands to wield it. He quoted Fred Astaire as an example of an actor who was always filmed from head to foot. It was in Astaire's contract, but then again, Astaire was worth watching. He said that the body is the actor's instrument, but the sword will always try to take over. He said that the trick is to use the whole body and you can fight slower, but it will appear faster.